For our last three days in China, we visited Beijing for a whirlwind of cultural sights. On our first day, we visited the Forbidden City – the most infamous palace in China. Closed off to commoners, it served as the country’s governmental center for almost 500 years. Walking around the palace was amazing, because for me it was almost impossible to imagine just how elaborately the royals of China lived. Personally, one of the biggest takeaways from our tour guide’s stories was how one emperor had about 300 concubines to himself. He set the record of course, but it was really hard to wrap my head around how such a system could remain in place for so long. I wondered how he could carry out necessary government affairs yet still manage to lead such a large household and palace. I also found out that up until the 1500s, some emperors had started and carried out a tradition of bringing their wives and some of their most ‘honored’ concubines with them into the afterlife – meaning that when they died, the empress and some of the concubines would be buried alive too, in order to accompany the emperor beyond. As a bonus, we ran into Governor Larry Hogan – the governor of Maryland. He even posed for a few pictures with us. After that, we briefly toured the National Center for Performing Arts, which looks nice on the outside, but has even more impressive architecture inside. It holds many world-renowned opera performances each year. At night, the four of us left on the trip challenged each other to eating some pretty exotic foods. All of us ended up trying at least a bite of fried snake, and a friend and I each ate a whole scorpion. Another friend ate a seahorse. Of course, these foods aren’t really typical of China – I think they’re more of a moneymaker for the street vendors, who can lure tourists wanting to eat crazy things just for the sake of saying that they’ve eaten something bizarre. There were starfish, turtles, tarantulas, cicadas and centipedes for sale too – but I’m really glad that none of us wanted to try any of those. The next day, we climbed the Northern part of the Badaling section of the Great Wall. Walking along the Great Wall of China is definitely an unparalleled experience – and it’s so worth it. Hearing about it being a remarkable landmark as often as we do can take away the awe factor over time, but hiking it in person puts it back in perspective. The Wall is over 13,000 miles long – and at one point, it was all connected. Today, many sections are separated because parts have crumbled or are unsafe now. Thinking about what it took to build it hits home too, as there are estimated to be over 300,000 people who died throughout the construction of the Wall. It was started during the Qin dynasty – the first dynasty – which, as I learned in Xi’an, was also responsible for the Terracotta Army. Our last stop was the 2008 Olympic Stadiums – the Bird’s Nest and the Water Cube. Visiting them was incredible, and it was nice to see that unlike a lot of other Olympic facilities, they are still being used for various conferences and other purposes. When it was time for us to all go home, we realized just how fast our 6-week adventure had flown by. The entire trip was really an amazing opportunity, and one that brought us all together while taking us to places many of us had previously only dreamed about seeing. We couldn’t have had a better experience. 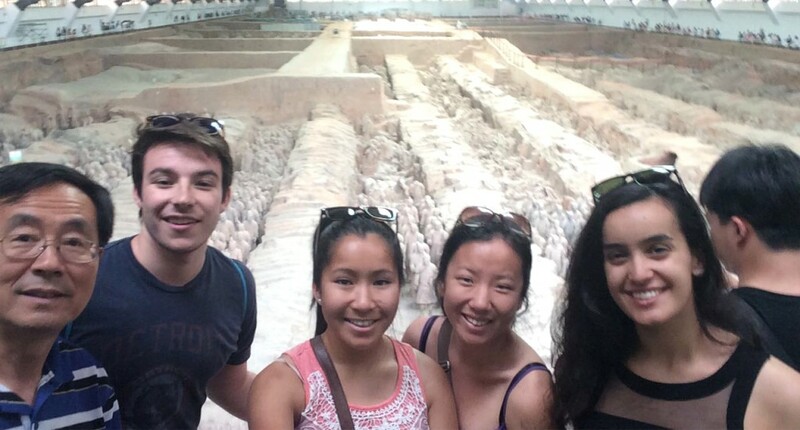 For the last week of our six-week program, we are visiting Xi’an and Beijing. Both are cities with incredible history and culture, and served as capital cities for China (Xi’an is the oldest of China’s four ancient capitals, and Beijing is the modern capital). Xi’an was formerly known as Chang’an, and was the origin of the Silk Road. As our first stop, we flew to Xi’an to meet with Professor Fu’s cousin, who served as our tour guide for many parts of our stay. The flight was delayed for a little over an hour with us sitting in the plane, so they fed us lunch early, but I was informed by some of my newly made Chinese friends and Professor Fu that in China, it is very common for flights to be so delayed. If a flight is delayed over three hours, then the airline needs to reimburse people. I couldn’t imagine an airline industry where that is the norm. Once we arrived in Xi’an, we had our first local lunch – and it was so delicious! The food in Xi’an is spicy, much more so than in Shanghai, and is mostly noodle-based. From there, we headed to Chang’an Temple. However, it was really hot and we were all pretty tired, so we elected not to hike to the top of the pagoda. Chang’an Temple, like many of the other temples we visited, has a lot of Buddhist relics and remains a center of worship for many. The next day, we visited the Terracotta Warriors. Seeing them in person was truly incredible, because they were built during the Qin dynasty (read: 221-206 BC) but only discovered in 1974. There are estimated to be over 8,000 figures – and of course they were all made by hand, so each is unique. It makes sense why some people call them the Eighth Wonder of the World. In the afternoon, we biked the City Wall. It is similar to the Great Wall of China in the sense that the wall was built to protect the city from outside invaders and it’s massive, but the City Wall is flat to walk on. One of my classmates and I checked out a tandem bike for fun, but it was definitely a challenge to figure out how to ride it successfully and still manage to avoid all of the other tourists walking and biking around. Not to mention that our first instinct to yell “watch out” or “please move” in English wasn’t particularly effective. We ended up meeting more American students there, from the Monmouth University basketball team. They had just played Shanghai recently and won. Our last stop for the day was an area known as the Muslim Street. It was a lively street full of all kinds of vendors, from souvenirs to drinks, candy to food. Before going to Shanghai and Xi’an I hadn’t realized that there was a growing Muslim presence in China. Unfortunately we got caught in the torrential downpour of a passing summer storm, and we lost each other for a little while – and as one would imagine, trying to find people in crowds in China is no easy task. Before I came to China, I knew nothing about Shanghai. My only memories of China were from when I was six years old, and I cannot even recall what part of China I was in (though according to my mom it was throughout Hunan province, and Guangzhou). I remember the different smells, different-looking people, different foods and a different language. There was one McDonald’s, though at the time the burgers were still made of soy and not beef, and there was a restaurant across the street from a hotel called “Lucy’s” (based on I Love Lucy) that sold both American and Chinese food. Other than that, not too many people spoke English well and the country looked like a very foreign land. Planning for this trip to Shanghai gave me the idea that by living in China for six weeks, I could get a pretty good glimpse into what life is like under a communist regime. I wanted to see how everyday life works in a country that, in a way, prides itself on isolation from the rest of the world, and I was curious as to how western influence has changed China’s customs, society, and government. After living for four and a half weeks in Shanghai and hearing numerous helpful lectures, I think that now I can begin to formulate answers to some of these questions – though of course I cannot fully examine any without staying in the country longer, and visiting more traditional areas aside from Shanghai. 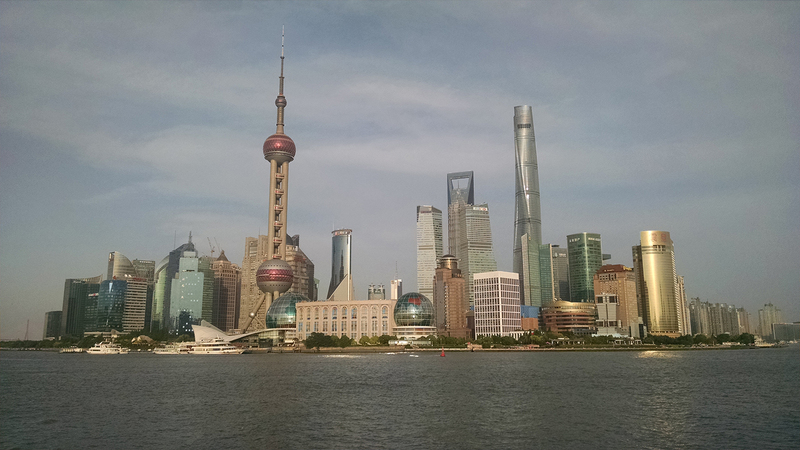 Shanghai is a very westernized, international city – I was not expecting it to be so developed, so modern, and so big. In many areas of the city, it felt as if I were simply walking around New York City again. There are many malls and outdoor shopping areas, all full of various things to spend a lot of money on. The malls have expensive luxury brands that cater to western preferences, with brands like Coach and Louis Vuitton and Barbour. At the same time, the outdoor shopping areas like TianZiFang and XinTianDi – as well as the areas surrounding places like water towns, temples and Yuyuan Garden – are full of vendors with small shops that are easily recognizable tourist traps. The city’s nightlife is bustling, though it mostly attracts wealthy, western and older crowds. Shanghai has its own dialect, which reflects its unique culture. Many Chinese people do not feel that Shanghai is actually part of China, because it is so westernized. The signs around the city are in English and Chinese, and there are many English-speaking people in Shanghai. The different parts of Shanghai are distinct, just like the different cities and provinces around China, which helped me to truly internalize just how huge the country is. Now I understand how diverse it is, and saying that one visited China will not universally mean the same thing to me anymore. It would be comparable to if someone said they visited the United States – because going to an area in Massachusetts would be a wholly separate experience than going to an area in Florida or Washington or Nevada. Katrina “Kiki” Spiezio is a rising junior from Taunton, MA. With a declared Politics major and Studio Art and Poverty Studies minors, she has embraced the liberal arts at Washington and Lee University through a QuestBridge Match scholarship. Traveling to China this Spring Term with a Gilman Scholarship allows her to reconnect to her heritage, because she was adopted from China and has started studying the language just this year. On campus, Spiezio is a Bonner Scholar who has enjoyed living in the Global Service House and being involved in everything from Electronic Music Ensemble to Club Polo to Dance Company. In her free time, she enjoys hanging out with friends, keeping up with social media, and going on new adventures.